Immigration reform is center stage right now – a top priority for President Obama’s second term in office. It is also centre stage for so many young people, many of our students here in California, who may be among the 11 million people in the U.S. without documents. They either came to theUS as young children or their parents immigrated to the US and remain undocumented. 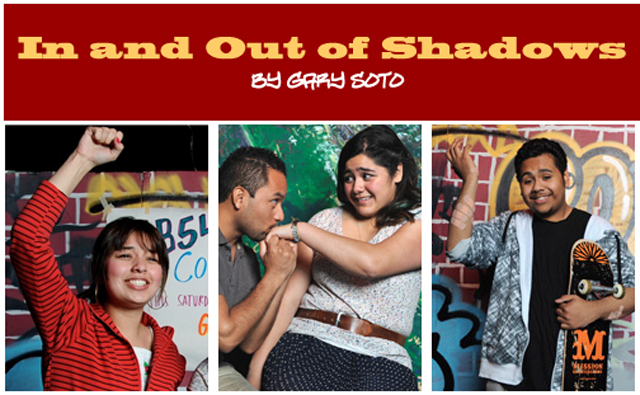 Their stories form the basis of new musical called “In and Out of Shadows” at the Marsh Theatre in San Francisco, performed by members of the Marsh Youth Theatre group. Written by Gary Soto, it is based on interviews with undocumented teenagers from diverse ethnic backgrounds living in the Bay Area, who describe how their dreams for the future look really bleak without papers. No college would accept them. No employer could employ them. They would be invisible. For example, Homero Rosas came to San Francisco from Mexico when he was 6 years old. “My parents would tell me I wasn’t from here, but up until then I didn’t know what that meant,”….. “I didn’t know it meant I couldn’t get financial aid, I couldn’t get a job, I couldn’t aspire to anything, really. I felt trapped.” His story is dramatized through his character, Juan. Through AB 540, the California law that allows undocumented students to attend college and pay in-state tuition, Rosas was able to graduate from high school, attend college and pursue acting. Similarly Alondra Duarte-Ferman, 15, plays Paola, a 16-year-old undocumented Guatemalan student, who is Salvadoran but was born in theUnited States. Gary Soto, who grew up in theCentral Valley, was inspired by the lives of working class Latinos. He describes the courage of the young actors who speak up for young immigrants living in fear of being deported or abandoned if their parents are undocumented and deported. Many of them speak from personal experience. Explores the idea of the American Dream through the personal stories of immigrants. There are many students from throughout the world in American universities who hold no citizenship. And recently a UC Berkeley student (and Math Club head) stated the case for the DREAM Act on YouTube, appealing to economic reasons why he and others should be allowed to stay. His claim is that it could net billions of dollars in the end. Prev Seven Reasons to Integrate PBS LearningMedia into Science Curriculum Next The Billion Dollar Question: How Will Immigration Reform Affect Adult Education?